For our July meeting of the SLMQG we talked about stash building. And while I could do a whole post just on the things we discussed, I'll save it for another time. The one thing I would like to share is the "filling in the gaps" portion of the discussion. Can you guess which gaps I needed to fill? I know, I'm totally surprised myself! With both pink and blue I have a nice assortment of lighter fabrics, but am severely lacking in darker/bolder prints. ...Until now. Yay, me! For the record my purple stash is pretty much non-existent. I blame that on the fact that I haven't met many purples that I like. My stash might have five purple FQ's in it right now, but I don't see that changing anytime soon. So now I'm curious, what color(s) is your stash lacking? Nice additions to your stash! 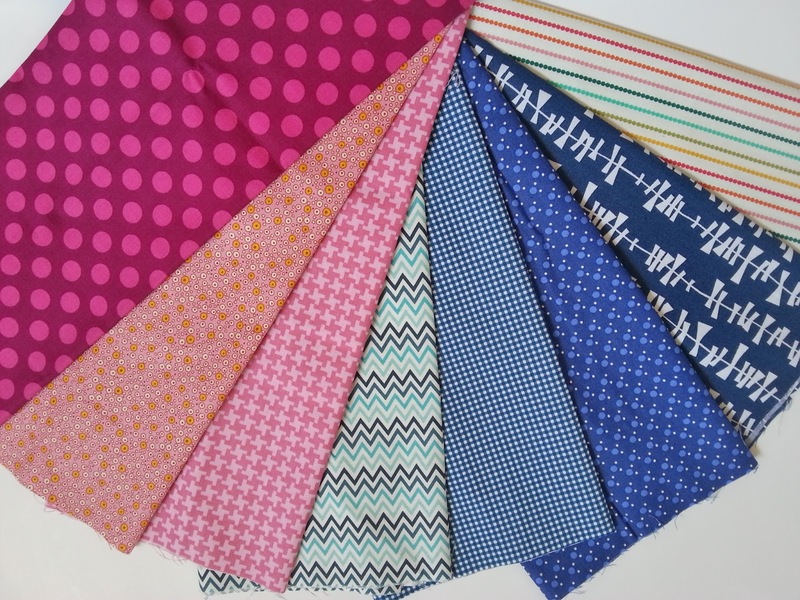 I've just finished participating in 7 months of the stash stack club with Pink Castle Fabrics and that did a lot to built up variety in my stash. However, holes appear in the areas of navy/dark blue, brown, and black.